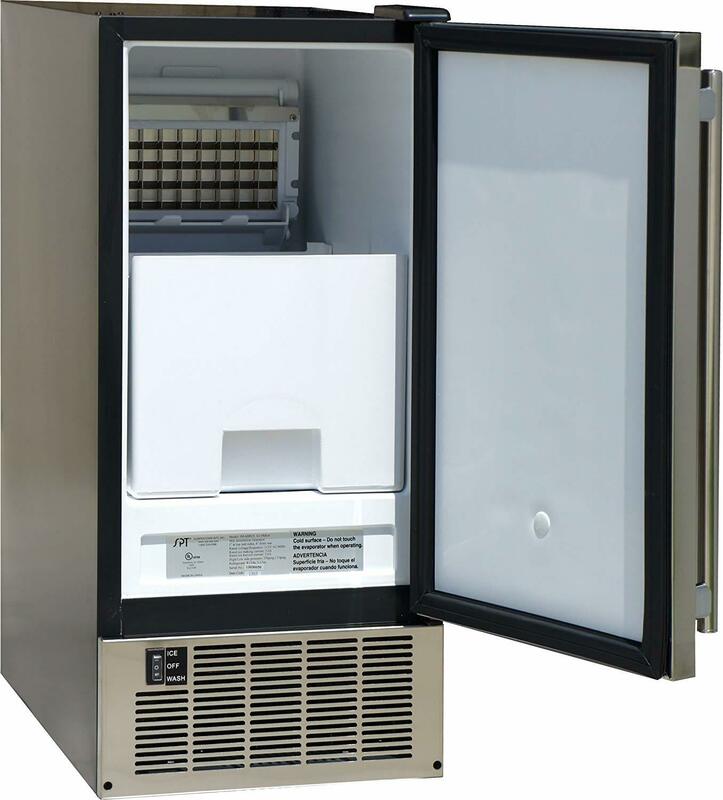 If you need an ice maker for your small or mid-size office, the SPT IM-600US undercounter ice maker is a good choice. It makes 45-50 lbs of ice per day, which should be enough to serve everyone in the office. The ice is clear and hard, not the cloudy fast-melting kind you get from a freezer. Because it has front venting, you can install it under a counter. 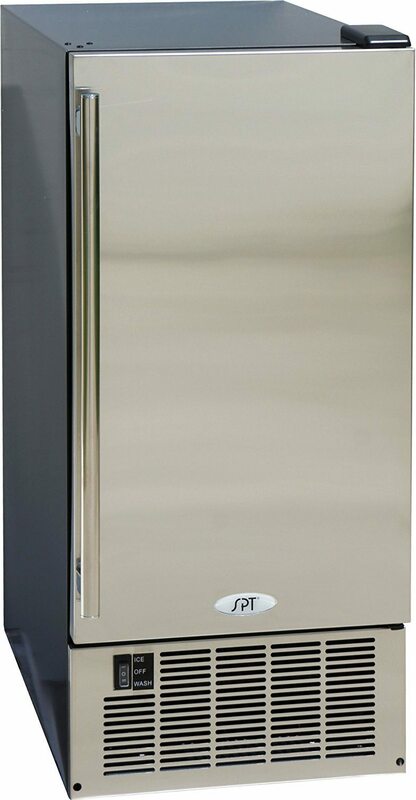 You can also use this SPT ice maker as a freestanding ice machine if that’s more convenient for your situation. For best results, this SPT ice machine should be installed by a licensed plumber. If this is not the kind of ice maker you were looking for, see our other recommended undercounter ice makers for more options. 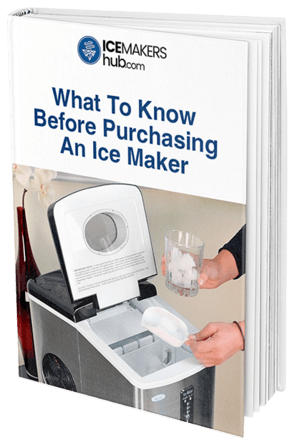 Commercial-grade ice makers are not cheap. This is especially the case for those that make clear gourmet ice. So finding a good one for less than $1,000 is an excellent bargain. 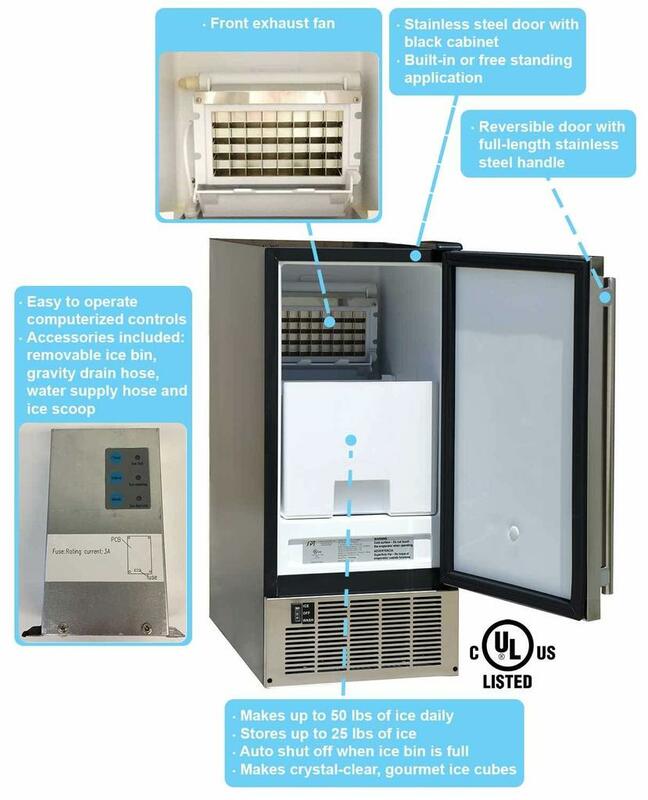 The SPT IM-600US is an affordable commercial-grade ice machine. 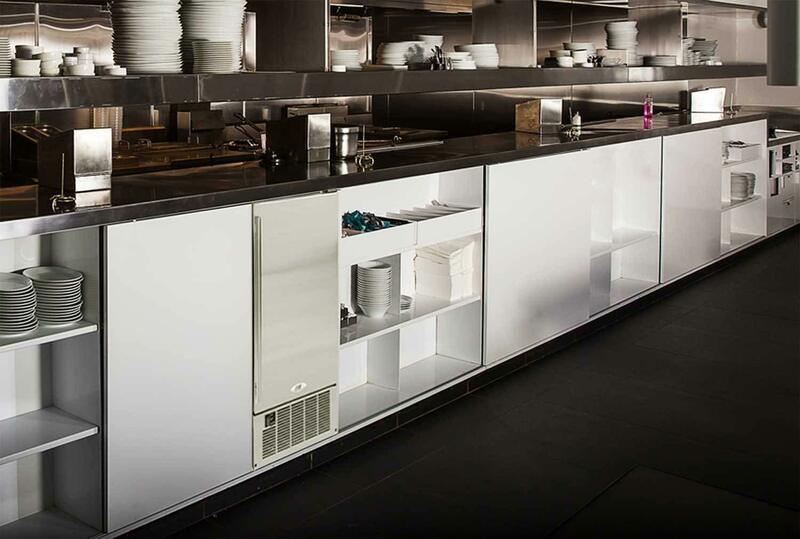 It has a professional-looking stainless steel door with a full-length handle. You can reverse the door swing depending on where you install the ice maker. But unfortunately, you cannot use your own custom panels. However, the stainless steel finish is great for offices. Not only does it look great, but it’s also easier to clean and doesn’t show smudges. It’s up to you whether you want it installed as a built-in or freestanding ice maker. It works well either way. The most important thing is to set up the water line and drainage correctly. The SPT IM-600US can make up to 45-50 lbs of crystal clear ice per day. That’s plenty enough ice for most small and mid-size offices. It’s also enough for a home bar or even a small restaurant or bar. It makes ice cubes quickly, dropping a batch every few minutes. After around 5 hours of continuous operation, it will have made about 25lbs of ice. This is enough to fill up the storage bin. A sensor stops the machine from making any more ice until you empty the bin. If you need more than the 25 lbs of ice, store the ice in a freezer and leave the bin empty to receive more ice. The bin is removable, so you don’t have to remove all the ice scoop by scoop. Just lift the whole bin and dump the ice cubes in a container or bag. Note that the storage bin is only insulated, not refrigerated. If you leave the ice in there for too long, it will begin to melt. The SPT IM-600US makes clear gourmet ice. This is the same hard and non-cloudy kind of ice you get at a bar or restaurant. The ice comes out in sheets which you have to break up into individual cubes. Each cube measures approximately 3/4" by 3/4" by 1”. The ice is great for most kinds of drinks. It melts slowly and also looks great. To get the best quality ice, the manufacturer highly recommends adding an in-line filter to your water line. This will prevent impurities from affecting the ice quality and building up inside the machine. If you can get distilled or reverse osmosis water, even better. It will lengthen the life of your ice maker. It’s also essential that you maintain the ice machine as directed in the user manual. This usually involves cleaning the inside every once in a while. Once a plumber installs the machine, using it is easy. You need to flip a switch, and the ice maker starts making ice. You don’t have to do anything after that. When the ice bin fills up, an auto-off mechanism kicks into action. So you don’t have to worry about an overflowing bin. 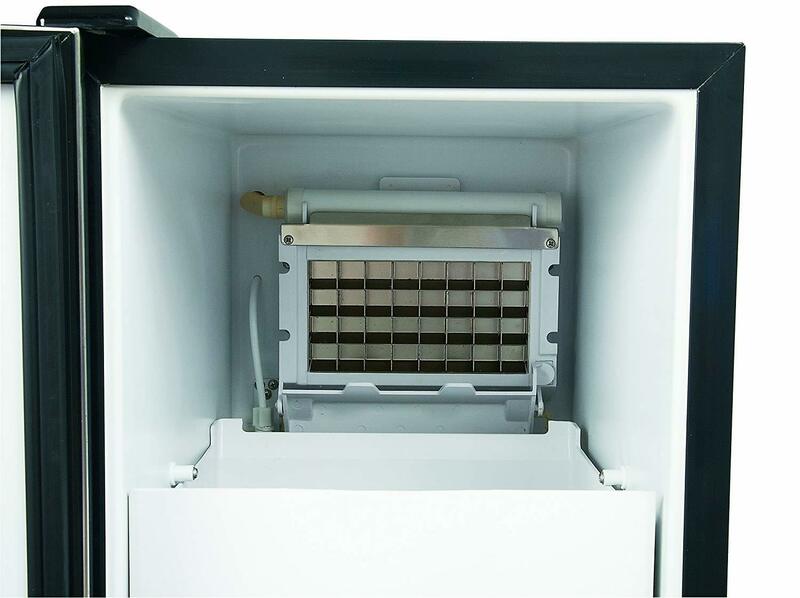 The easy one-switch operation makes this ice maker especially ideal for offices. Anyone can come and scoop ice from the bin. They don’t need to change any settings or learn how to use certain features. Maintenance is easy too. All you need to do is clean the inside with citric acid twice a month to get rid of mineral build up. This keeps your ice maker in good condition for years and prevents any stale odors in the ice. Many customers on Amazon and other retail sites love the SPT IM-600US ice maker. They say it’s easy to use, makes a good amount of ice and the ice cubes are more or less perfect for most of their needs. The only complaint we've seen is that the ice comes out in sheets rather than individual ice cubes. They are easy to break apart but only with a stainless steel scoop. So first thing you should do when you get this ice maker is put away the plastic scoop they include with it and get a stainless steel one instead. Another issue is that there isn’t a pump-operated version of this ice maker. For users who cannot use the gravity drain, you’ll have a problem draining the water. I recommend you ask your plumber to find a way to drain the water when they are installing the ice maker. Maybe they can even find a way to direct the drain hose outside. If you keep buying bags of ice for your office, this is a much better alternative. You get 45 lbs of quality gourmet ice every day free of charge. It will cost you some in the beginning because of the extra plumber fees, but it is worth it. The SPT IM-600US is just the right size for small and mid-size offices. Not too big that it takes up a lot of space but big enough to make enough ice for everyone. It’s also a great buy for home bars, kitchens and even commercial bars and restaurants.